Frances Evelyn Maynard became the heiress of Easton Lodge at the age of three in 1865 when both her father and her grandfather died. "Darling Daisy" as she was known to the family, grew up to be a beautiful and spirited young woman who might have married Queen Victoria's son Leopold had she not fallen in love with his friend Lord Brooke. She became the Countess of Warwick when her husband succeeded to the title and spent time between Warwick Castle and Easton Lodge. 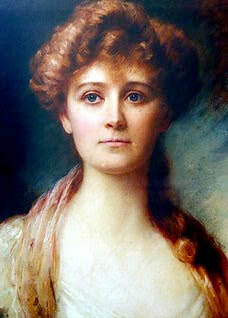 Following the birth of her first son, Guy, she embarked on affairs with Charles Beresford (later Lord Admiral), Edward Prince of Wales for 9 years (later King Edward VII) and Joe (later Major) Laycock who was the "love of her life". 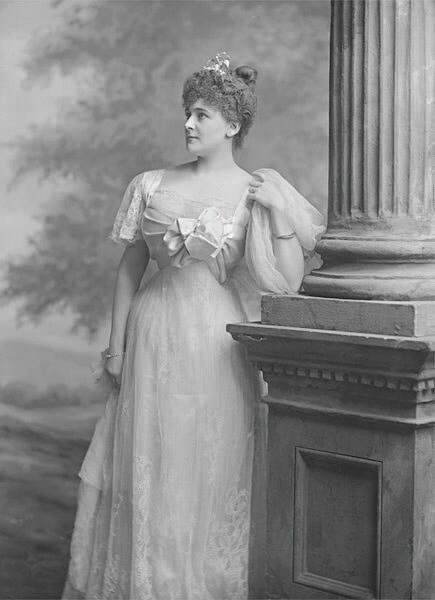 You may wonder what a leading Victorian socialite had to do with the Flitch Way. Her estate at Easton Lodge passed close by the Bishops Stortford to Braintree line. After much campaigning by the Earl and Countess of Warwick, a Halt or request stop was built at Little Canfield in 1894 and named Easton Lodge. Although it could also be used by local passengers, the prime purpose of the Halt was for the benefit of house guests visiting the Earl and Countess. Ramsay Macdonald and King Edward VII were regular visitors. The Countess agreed to pay £52 per year for 10 years towards the upkeep of the station but that arrangement subsequently lapsed in 1898 when the Countess refused to pay. In 1895, she held a luxurious ball at Warwick Castle and was criticised for the waste of money on such frivolity by Robert Blatchford, the author of left-wing 'Clarion'. She stormed down to London to confront him and returned home with head full of socialist ideas. Daisy paid for training in embroidery among the girls on her estate and sold the products in a shop in Bond Street, London. She was on the Poor Law Committee, and pushed for free school meals and the education of girls and women. She funded a secondary school, Bigods, near Dunmow and a School for Women Gardeners firstly at Reading and then at Studley. In 1926 she stood for parliament for the Labour Party and lost to Anthony Eden, for whom her whole family voted. ​Easton Lodge became host for many like-minded celebrities such as HG Wells, Gustav Holst, Bernard Shaw, as well as her old aristocratic friends. It was the venue for Labour Party Summer Schools and TUC conferences. Daisy wished to leave Easton Lodge to the TUC to become a college for working people, with the gardens open to the public. She was heart-broken when this offer was refused when the TUC lost money in the General Strike; also because there were those who thought the Lodge was the "right image" for the Labour Movement. Daisy remained at the Lodge surrounded by her beloved animals, and died in 1938. She has left many books about her life and her love of wildlife and gardens. The Gardens of Easton Lodge are being restored and are open to the public on selected days. To find out more click to go to the Forgotten Gardens of Easton Lodge website. The sunken Italian garden, © Gardens of Easton Lodge Preservation Trust. Partly reproduced with kind permission of the Gardens of Easton Lodge Preservation Trust.